To have energy to play you need to eat. And there are lots of picnic places here in Astrid Lindgren’s World. If you bring your own food, you can sit down in one of our many nice places to eat. We can particularly recommend the Birch Trees below The Tiny Town and the Picnic Trail. The trail is next to a mere, and there are several nice places to sit. Freshly baked buns and cakes for the picnic can be bought at A Larssons Bageri on Troublemaker Street. 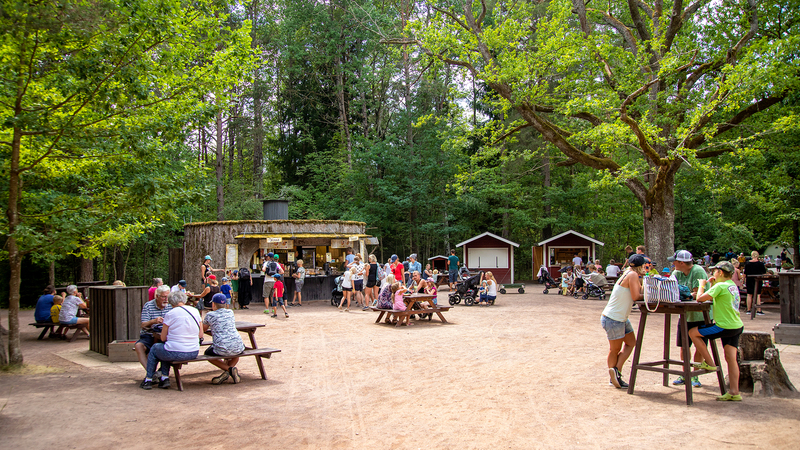 There are a few proper barbecue places in the park: in Matt’s Forest and the Birch Trees, and by Brenda Brave and Villekulla Cottage. Charcoal for the barbecues is available to collect from the nearest sales outlets.